The Hotel Sun Holidays is a hotel in Puerto de la Cruz that is located on a pedestrian street very close to the historic center of the city. Playa Jardin is 300 meters away, San Felipe Castle is 550 meters away and the well-known Loro Parque is approximately 1.km from the resort. El Teide is just over an hour away by car and the airport is about 15km from Hotel Sun Holidays. In this hotel you can find single, double, triple, quadruple and studio rooms. The latter includes an equipped kitchen with a coffee machine and kitchenware. All rooms have flat screen TV, wardrobe, bathroom with shower or bathtub, balcony, wake-up service, bed linen, towels and free Internet access via Wi-Fi. You can rent cars and bicycles at reception, where you can also request tourist information. There are public parking areas as well near the hotel. The Hotel Sun Holidays is located on a pedestrian street in the historic center of Puerto de la Cruz, just 5 minutes’ walk from the city center and about 300 meters from Playa Jardín. In the area there are a large number of bars, supermarkets and traditional restaurants. The Church of Our Lady of the Rock of France is about 750 meters away, the San Felipe Castle about 550 meters away and the well-known Loro Parque is 1.6km away. The North Tenerife Airport is 15 minutes away by car, while the Teide National Park can be reached in just over an hour. 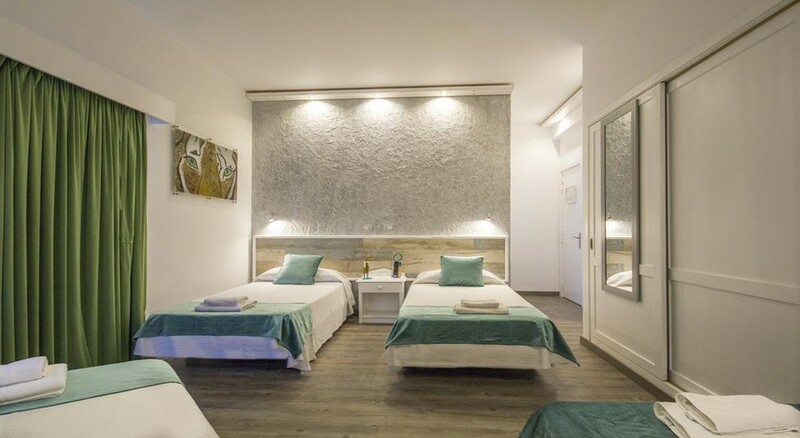 In this accommodation you can find different types of rooms: Individual, Studio (apartment with two single beds or a double bed), Double, Triple and Quadruple. All rooms have a balcony, flat screen TV, wardrobe, toilet with bath or shower, free Wi-Fi and wake-up service. The rooms measure from 15 m2 to about 24 m2. Bed linen and towels are included in the price of the rooms. The studio has a kitchen equipped with kitchenware and a coffee machine. As all rooms are equipped with a kitchen and guests can cook meals of their choice. Explore the locality of Puerto de la Cruz and taste a variety of cuisines at restaurants like Casa Mediterránea, Al-Amir Lebanese restaurant & shisha and lots more. Free public parking is available near the hotel, and tourist information can be obtained at reception to discover the most charming places on the island. At reception, you can also rent a bicycle or a car and explore the surrounding area. There is an Internet connection in the common areas and there is also a TV lounge too. The nearest beach is located around 1.5km away and there are a wide range of bars and eateries in the area surrounding the hotel. Baby cot and pet carrier are available for free up on request.